From the "Massy-Palaiseau" station (accessible by RER B, RER C or TGV - the RER station is adjacent to the TGV station): take the Albatrans bus n ° 91.06B, n ° 91.06C, or n ° 91.10 passing by Ecole Polytechnique bound for Saclay-Christ (RN306). Get off at stop "Ecole Polytechnique RD 128", just in front of the buildings of the Institut Optique Graduate School and Thales. From Orly airport: take OrlyVal to "Antony" station, then RER B to "Massy-Palaiseau" and Albatrans bus (see above). From Roissy-Charles de Gaulle Airport: RER B direction "Saint-Rémy Les Chevreuses" or "Massy-Palaiseau" or "Orsay" and get off at "Massy-Palaiseau," then take the Albatrans bus (see above ). At Porte de St Cloud, follow the N 10 in the direction of "Bordeaux / Nantes". Take the N 118 towards "Bordeaux / Nantes / Orleans / Chartres". Take exit n ° 9 Centre Universitaire. 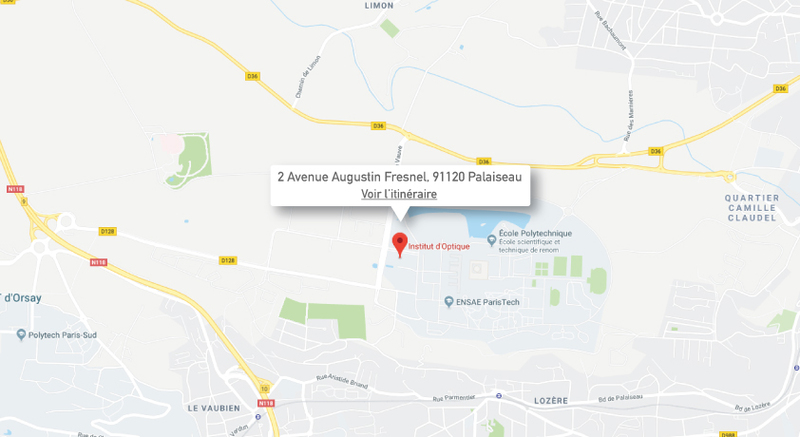 After passing two roundabouts, follow the direction RD128 Palaiseau. Take the fork to the A10 motorway, follow A10, then take the direction of Versailles / Igny / Bièvres / Cité Scientifique (the N444, left lane). Continue on the D36 towards Saclay. Do not take the left exit "Ecole Polytechnique" because the Institut d'Optique Graduate School is on campus and not in the Ecole Polytechnique. Continue straight on the D36 and at the roundabout turn left on the RD 128 towards Orsay / Saint-Aubin / Gif-sur-Yvette. The Institut Optique is on the left, 500 meters further on next to Thales.